Many will be surprised to learn that henna can be used not only for dyeing your hair, eyebrows or creating body henna designs but that with the help of henna, you can also paint your nails and strengthen them with a natural and absolutely harmless dye. 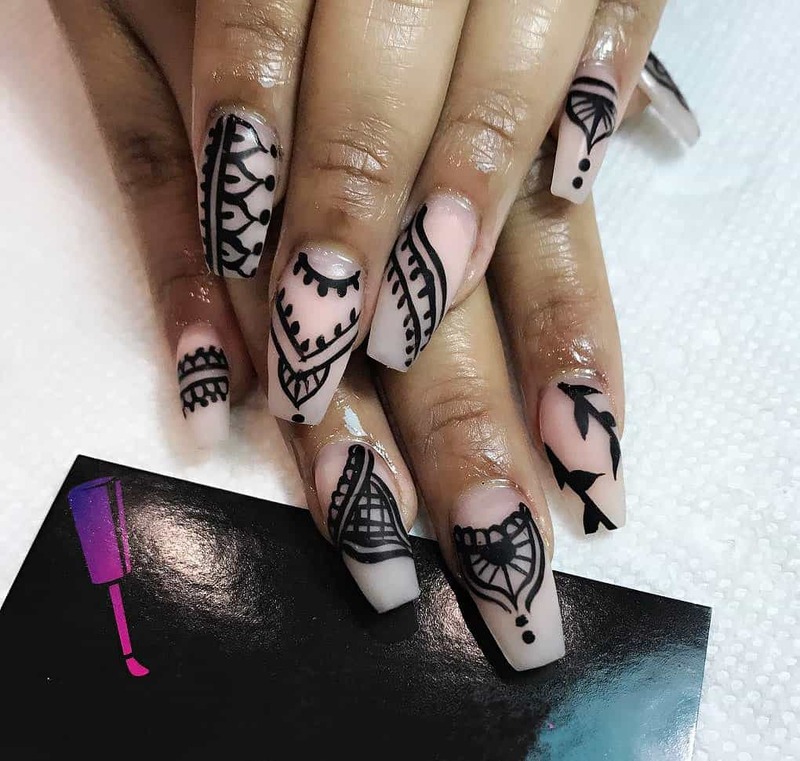 Unfortunately, in recent years, henna is rarely used for for those purposes preferring the treatment of nail lacquers, not devoid of chemical composition and other artificial substances. And that”s a shame. Henna wonderfully restores the structure of nails, promotes their growth and strengths it’s form. In addition, henna has anti-fungal properties with is important if there is something on this kind on your hands and nails. 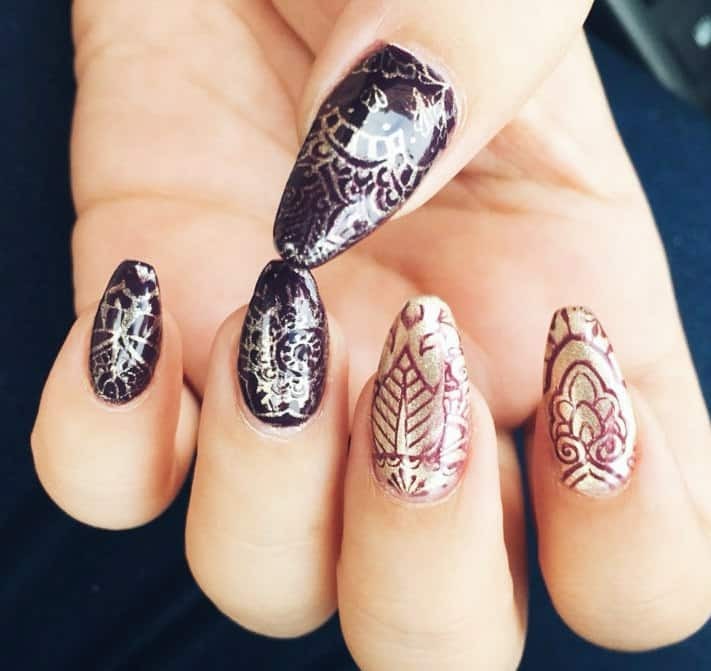 About nail henna colors, when you mix henna with different dyes – turmeric, coffee, red wine, cocoa, cranberry juice – you can get different shades of color, but they will always be from light red to copper or dark-cinnamon shades. The intensity of the color depends on the frequency of the application, if you want to get a steady juicy color, you need to regularly paint the nails with henna. If your goal is not beauty, but treatment, then it’s better to take henna without any additions. In general, for strengthening the henna nail applying effect, you can drip some essential oil in the paste you going to create later, for example, Eucalyptus essential oil. Essential oil deeply penetrates deep into the nail and will contribute to the restoration of its structure. It’s enough to apple 4-6 drops of essential oil into the henna paste mixture. 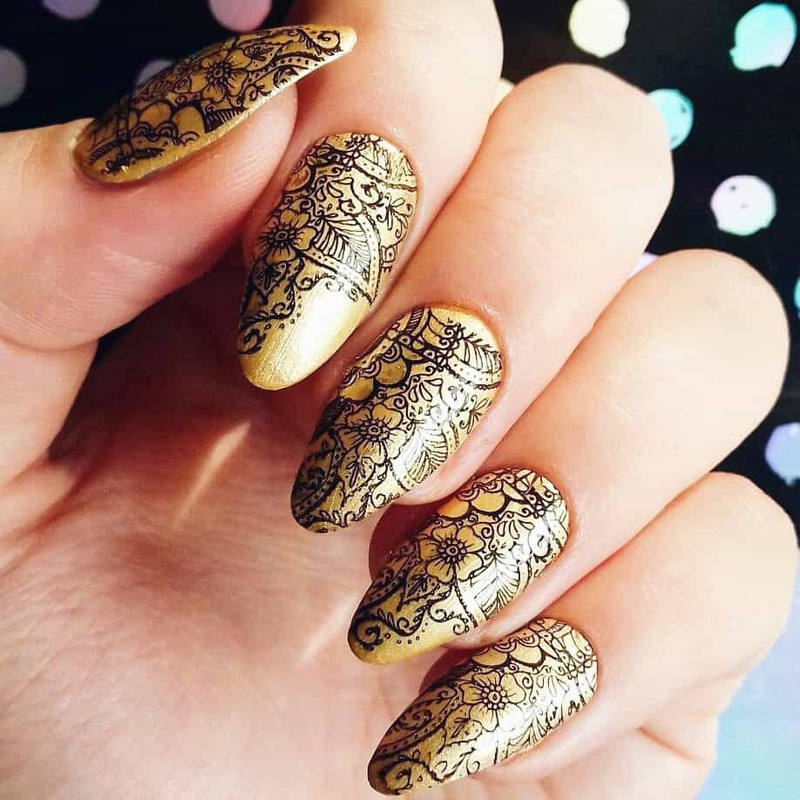 The process of painting the nails with henna is a bit laborious and won’t tolerate a fuss, so it’s better to do it in a quite and comfortable environment without many distractions and and external interference. Last thing before we start, it’s important to remember that henna stains the skin as well so avoid getting the paint on your hands. We will learn later how to better protect your cuticles and keeping them clean and safe. How to Color Nails with Henna By Yourself? Step 1: Clean your nails with a nail brush and liquid soap. 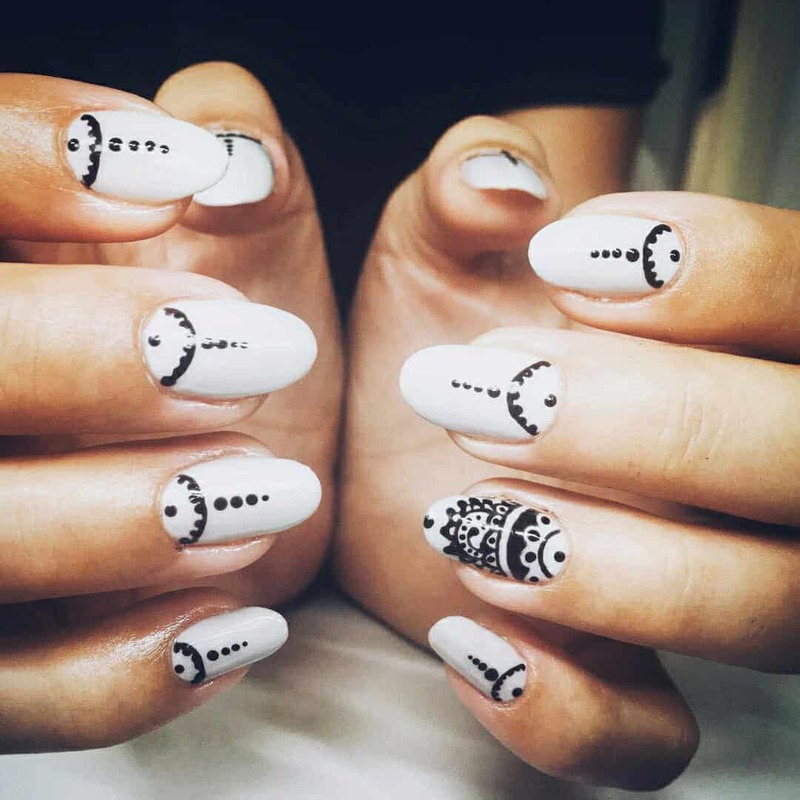 Make sure that all the cream, wax and sweat is removed from the nails, otherwise henna nail coloring may be uneven. Thoroughly dry your hands and nails. Step 2: Making the henna nails paste. Place 1 tablespoon of henna powder in a glass dish, add 1 1/2 tablespoons of hot water and and a bit of lemon juice. Stir with a spoon until it is in the same state and later cover it with a wrap and leave it untouched for 4-6 hours so it will release it’s dye. Step 3: You want to color only your nails, right? Using a cotton cloth, apply a small amount of vaseline on your cuticles. This will help prevent the cuticles from being colored together with your nails. Step 4: Using a spatula with a rounded tip, apply a small amount of henna paste the entire surface of the nail, being careful not to fall on the cuticle. You can use a cotton cloth to press a thick mass against the surface of the nail. Step 5: Wait 3-5 minutes, then wash off the henna with warm water. If necessary, use a nail brush to remove the remaining henna particles. Paint the next two nails and so on, until all of them are painted. Step 6: After completing the previous step, carefully wipe your hands and “polish” your nails with a piece of cloth to give them extra shine. Now you can continue with applying other designs on it. Please remember that painting your nails with henna by the above method will give your them a subtle peach tint. If you want to achieve a more noticeable effect, apply henna on the nails for another 1-2 minutes or even more. Play with the way you creating you henna paste and the time you apply the henna on your nails. There is nothing better for a small trial and error to discover the colors that henna patterns can create.